Today’s challenge was deceptively simple: eat veggies at every meal. I interpret that as meaning at least one serving of veggies (not just a garnish). In this case, the two health challenges I’m doing directly conflicted with one another! The planned breakfast for the FitGirlsGuide 28-day jumpstart has cherries, but no vegetables. I expect that’s going to happen occasionally. Embracing the “progress, not perfection” mantra, I grabbed a handful of baby carrots with my breakfast and skipped my snack during the day. Normally, I’m quite happy to incorporate vegetables into my eggs. Especially onions or shallots. Also tomatoes. And maybe spinach sometimes. I like the combination of tomatoes and eggs–especially something like salsa! For lunch, veggies were already included: 1 cup of roasted vegetables. Mine was a mix of roasted pumpkin, carrots, and onions (because that’s what I had on hand when I started the challenge). There’s also a handful of steamed kale in there. Dinner also already had vegetables included: the pita pizza party called for mushrooms, bell pepper, and spinach in addition to the marinara sauce. I found that I really missed onions on my pizza. I also think that next time I try that recipe, I might put the toppings IN the pita pocket since mine slid off and made a horrible mess… but still a fairly tasty mess. If it had been photo-worthy, I’d’ve taken a picture for this post, but nooooo…. 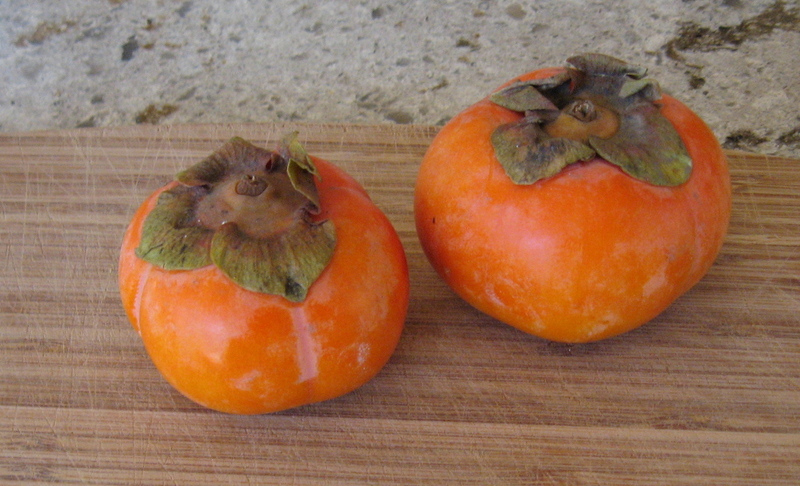 Fuyu persimmons, one of several varieties and definitely NOT a vegetable. Special bonus round: tonight’s meal was also to be accompanied by a half cup of fruit. I had a persimmon. If you’ve never had a persimmon, they taste like jam and they’re heavenly. My spousal substitute just had a bite and I swear I think his eyes rolled back in his head–and he’s a carnivore. You can learn more about one of my favorite seasonal treats over at the Botanist in the Kitchen!